Precious!!!! Love the Light and Dark mixed.... Another Awesome BG with a Beautiful LO!! These are exceptional Donna you seem to be having fun with your own BG's well done. i am Kaye. I hadn't done any scrapping for a long time as I have been really unwell. I picked it up again and I am hooked again. I have really enjoyed both of your challenges this month, and I hope you will continue doing them, and thanks to you and Kimmyann for your lovely comments. 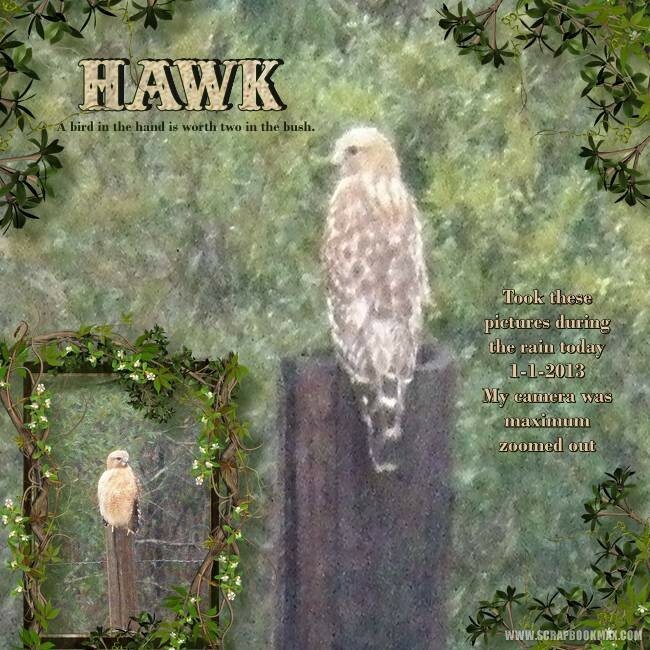 This was so Neat.... (You know I am Country) I walked out on the back porch to watch it rain a little bit and saw this Hawk. It was so Big and Pretty, just sitting on the post in the rain. That's a really great pge Kimmy, very nice.